This rich chocolate tart is ideal for a summer dinner party with friends or even if you're just feeling like something extremely naughty and chocolatey. Works well as one big tart to slice up and share or can be made as 10 individual little tarts. Place the almonds into a food processor and blend until it turns into a sticky flour type consistency, remove from the blender and put in the dates to blend until really tiny bits. Then put the almonds back in and add in the coconut, the coconut caramel and maple syrup and pulse so it is all mixed in together. Grease a baking tray with some dairy free butter (or coconut oil if you have it) then press the mixture into the tin using a spatula so you have an even base. Bake for 15 minutes until brown and then remove from the oven and allow to cool. For the filling, melt the chocolate over a bain marie, once it has melted let it cool slightly - then stir it into the coconut cream. Mix in the ground almonds and maple syrup then simply place the filling onto the base and spread evenly. I finished the tart off with some coconut flakes but some desiccated coconut sprinkled on top would also look pretty and give that extra hint of coconut. 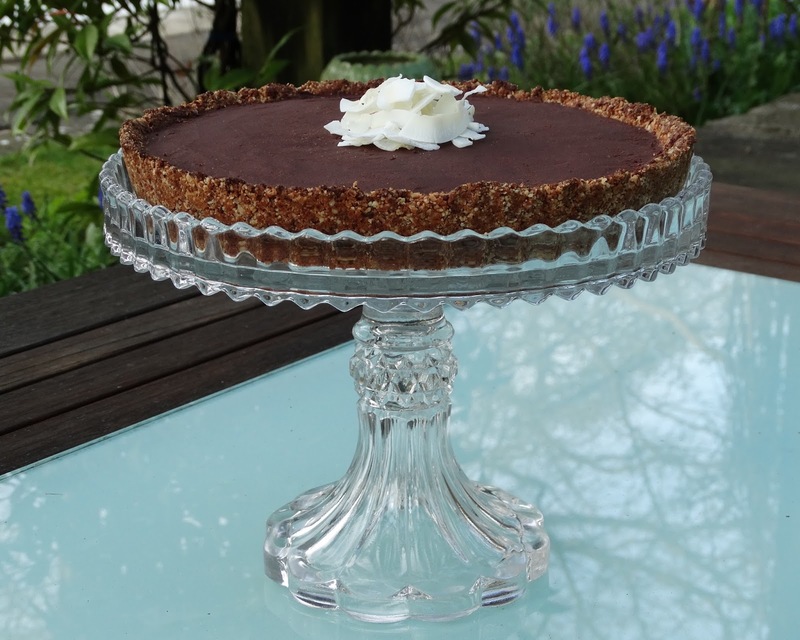 This is a fairly rich and indulgent chocolate tart so you may only want a small slice - Serve it up with some cold coconut cream or even almond milk ice-cream. Hope you enjoy this one as much as I do!